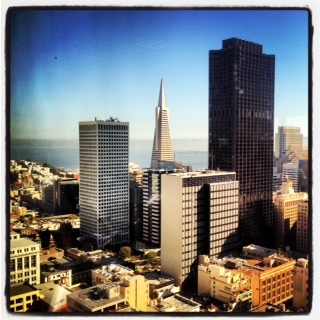 With sunny, crisp, fall-like weather finally hitting Texas, I’m reminded of our recent visit to San Francisco, California. The air just feels different on the West Coast, especially in NorCal: a fresh sea breeze combines with that dry coolness and creates a feeling of lightness in my lungs. I just love it. We’re experiencing the rare treat of Cali-perfect weather today in Austin and besides keeping the windows wide open throughout the house, today posed the perfect opportunity to review & share some San Fran photos. We arrived at SFO around 4 p.m. on a Wednesday and raced to get in the rental car but of course, traffic on the 101 was already backed up. I guess dealing with traffic just comes with the territory in CA…we’re always hearing about their gridlocked highways & long commutes in the media, right? (Have ya seen the SNL sketch, “The Californians”? LOL!) On the bright side, extra time in the car gave us a chance to admire the sights along the coast and discover a sick local hip-hop station, 106 KMEL — it’s awesome, they play new stuff but with the best mix of old school West Coast rap Seriously, I made sure to bookmark this station so I can listen back at home on our SONOS system. Once we made it to our hotel, we were starving and decided to move up our reservation and just have an early dinner. We kinda forgot to figure in the two-hour time difference (uh, hello!) and pushed our 7 p.m. reservation up to 5:30. 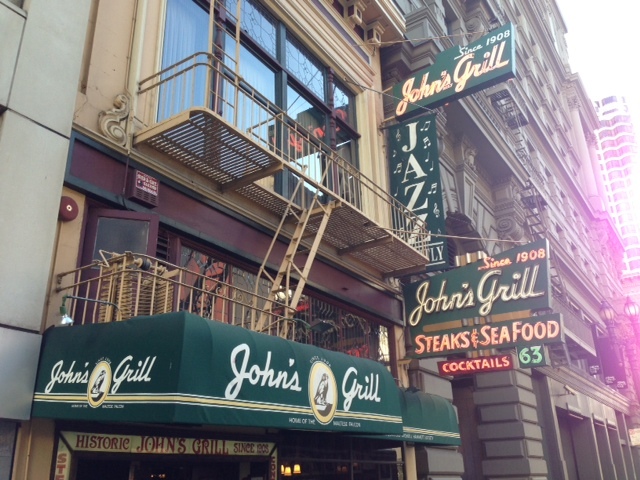 There is so much great food in San Francisco…a couple restaurants we’ve read about recently in the press were all booked up, so we opted for a traditional can’t-go-wrong experience by dining at the historic John’s Grill. Walkable from our hotel in Union Square, John’s Grill was perfect for that first night in town. The menu has something for everybody but we were most excited about a few San Francisco staples: sourdough, fresh lump crab, and clam chowder. Their sourdough bread arrives fresh daily from Boudin Bakery and is the original San Francisco sourdough, since 1849. I mainly go for that crust…yum! Next up: Golden Gate bridge. 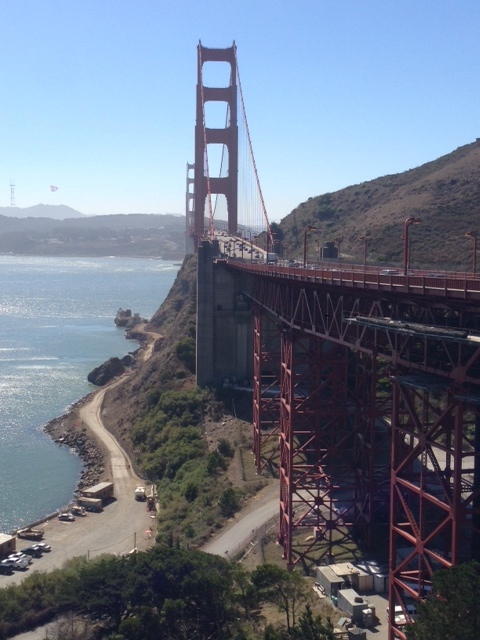 I’ve driven over this iconic bridge a few times before, but couldn’t believe my husband had never done it. It was fun to share that first with him. Again, blessed by catching the beginning of their Indian Summer, the weather was perfect and the sight was enthralling. Then, as per GQ’s recommendation, we beelined to the Mission area to find Craftsman + Wolves. 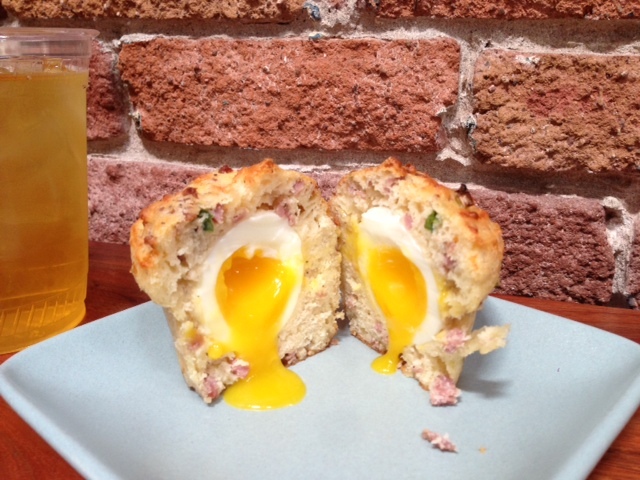 This bakery & coffee shop has created the coolest savory pastry: a soft-boiled egg that’s baked into the center of a muffin. I get excited by new culinary experiences and “The Rebel Within” was definitely like nothing I’d ever seen. The rest of the day was spent back in Union Square, filled with shopping (um, how freakin’ awesome is Uniqlo?!? ), drinks, and dinner with friends. ‘Til next time, San Francisco!